Veteran forward, James Naka. 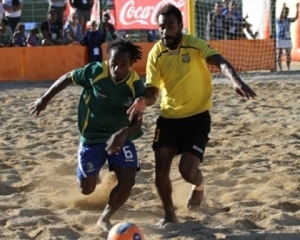 led the Bilikiki to the win with stellar performance to give the former champions the perfect start to their campaign to join hosts Tahiti at the 2013 FIFA Beach Soccer World Cup. His hat trick gave the Bilikiki enough headroom to escape a late comeback by Vanuatu spurred on by the community Ni-Vanuatuans based in Noumea. The start, however, was not smooth as Vanuatu opened their docket first with captain, Antonia Malapa, finding the back of the Solomon Islands net four minutes after kickoff. This lead was short lived as Joe Luwi levelled proceedings midway through the first third. No more goals were added in the first third and it ended at 1-all. Robert Laua gave the Bilikiki the lead three minutes into the second third with a powerful low shot. In front for the first time in the game, the Bilikiki pressured on and Naka extended the lead to 3-1. Replacement setter, McPhilip Aisa, did his reputation a great favour by taking the lead to 4-1 with his effort but Naka ensured the limelight today belonged to him by addin the Bilikiki’s fifth. Before the third ended, futsal goalkeeper Anthony Talo took it to 6-1 with a shot to the post. The final third was fiery spectacle as both sides managed to get two a piece on the scoreboard. The Bilikiki took the first two through Naka and Luwi to give themselves a comfortable 8-1 lead. The Vanuatuans, however, had other ideas and kept the Bilikiki under pressure with two goals coming late in the match from Ivong Wilson and Daniel Natou. The Bilikiki will play hosts New Caledonia in the final match of the championship on Monday. They are expected back in the country the following day.